Finished My Block for the Fiber Guild’s Group Project! Eight Ladies and a Key? Just finished this 9″ block about two hours ago. It is my contribution to the group project the Appalachian Ohio Fiber Guild will donate to the French Art Colony. Their Silent Auction is March 2, when our wall hanging and more than a hundred other items will be auctioned off to support activities at the FAC, where we hold our monthly meetings. We have 12 blocks in all, contributed by our members who spin, crochet, knit, felt, tat, weave and quilt. It is quite a challenge to combine such a diversity of techniques into a unified artistic endeavor! We do this by specifying the size (a 9″ square block) and the use of the same color palette–black, white, grey and silver. In constructing the block, I used clipart for the raw-edge appliqued women and key. 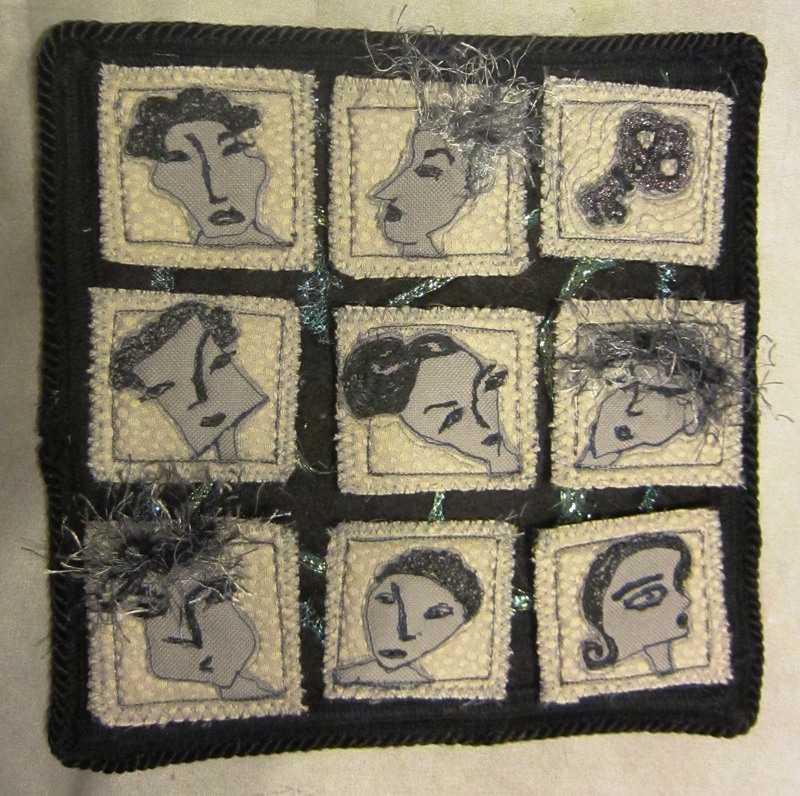 All but three of the images have multiple layers of felt to raise them above the surface of the black felt background. I used shreds of iridescent fabric behind the icons to link them visually and to accentuate the key, which is top stitched in a coordinating iridescent metallic thread. The wild hair is variegated yarn. The entire block is edged with satin cording. Although the photo shows light tan squares, they are actually light gray–it must be a trick of light that changes the color. This year’s construction process is going much easier than last year’s. There was so much to learn about what worked and what didn’t, in how we combined squares from our members. This year, my friends Mary, Marlene and I actually decided on the overall format (three fabric panels, hung from a single rod), agreed on the background fabrics and cut patterns for each panel. 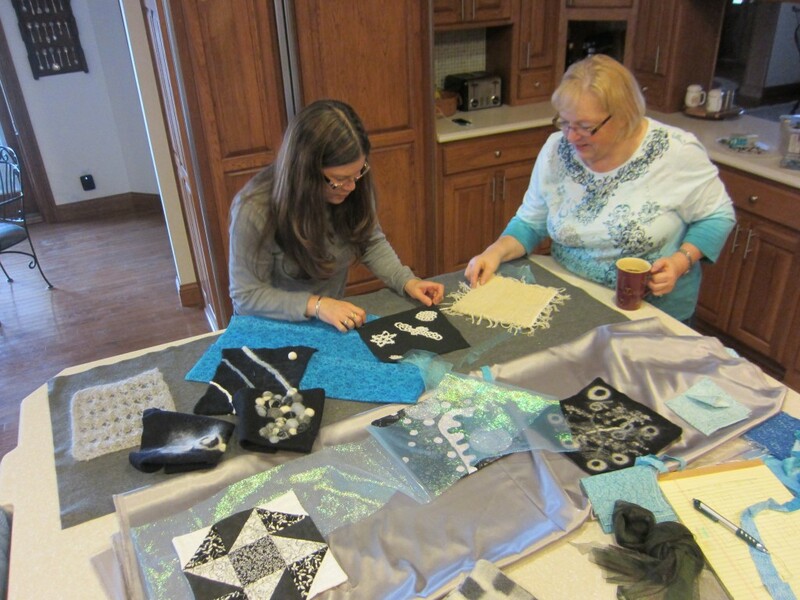 Mary agreed to sew the panels, and Marlene and Mary both took fabric swatches to look for beads and accent fabric. Meanwhile, I went to Arizona for two weeks! Tomorrow we meet to attach the twelve blocks to the three panels of fabric. The two outer panels are grey satin, the inner panel is grey felt, and these background panels will be accented with pieces of iridescent turquoise fabric (the same I used in my block.) I’ll post a picture later! Entry filed under: Uncategorized. Tags: fiber art, French Art Colony, multi media, Silent Auction. Who Is the Creative Cat?